As 2008 approaches its end and we think back on all the big films of the year, we must take time to look forward at what is to come. 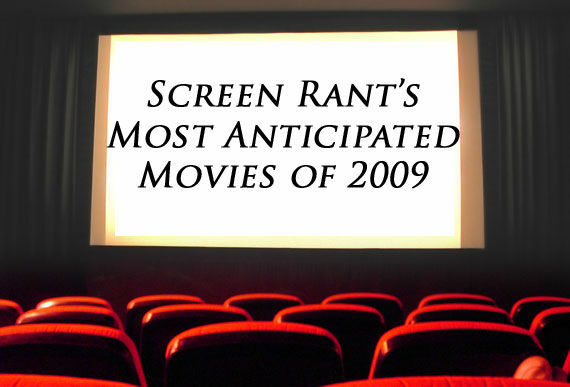 That is exactly what we will do now - And I don’t use the term “we” lightly as I enlisted the help of the entire Screen Rant team to help me share with you our individual and collective thoughts of what movies to look forward to in 2009. We began the tradition last year with the most anticipated movies of 2008, and here's your bright, shiny 2009 version! This was not an easy task to say the least. While there are several obvious big-name titles coming out next year, there are also 765 movies planned to debut next year in total (according to Movieweb). Narrowing that down to just ten is not the easiest of tasks especially when certain films have shared little information with us so far (wink wink nudge nudge to James Cameron’s Avatar). Using all of our individual choices and an elaborate scoring system that took hundreds of hours to deliver its results (OK, I made up that last bit), I summed up and calculated our overall most anticipated movie of 2009 list for the Screen Rant team. Featuring an abundance of well-known voice talent and a hilarious plot, this film looks like fun for all. Along with Disney’s Up we expect a pair of solid animated films next year. I’ll also be seeing this one in 3D! The sequel to the loved and hated Summer blockbuster of 2007. Can Michael Bay turn some of those frowns upside down with this sequel that he co-wrote? Will there be more robots, less people, better story, less corniness and better characters? We hope so and some of us are looking forward to finding out from this action-adventure. Disney Pixar’s next 3D-animated experience. The beautiful-looking 3D-animated film about a 78 year-old man and a young boy stuck together on a wondrous journey into a lost world. I’m definitely seeing this one in 3D. The notorious life of gangster John Dillinger brought to the big screen. Starring Johnny Depp, Christian Bale and several other stars featured in other big films next year, this 1930s-style crime and dime movie should be awesome. Little has been shown so far, but we have high expectations from the cast and story alone. Quentin Tarantino’s World War 2 Epic is finally arriving. Tarantino’s been subject to some mixed reviews on his most recent projects – can this be the one to turn it around? We’re certainly hoping and looking forward to it and its interesting cast includes Brad Pitt, Mike Myers and Eli Roth. Wolverine’s origins are detailed in this prequel to the X-Men trilogy. Hugh Jackman - Sexiest Man of the Year – is back in his career-making and fan-favorite invulnerable adamantium-laced claw-sharpening mutant. I’m sold on the support characters alone – this movie should be tons of fun – but will the story be any good? The fourth Terminator feature film starts a new trilogy. The franchise hits the big screen again in this sequel/prequel to the Terminator Franchise. Starring Christian Bale as John Connor and a plethora of new Terminator designs, we look forward to McG’s new direction for the franchise. The rebirth of the franchise is upon us thanks to J.J. Abrams. Can this prequel/reboot of a film bring Star Trek back to the mainstream and make it “cool” once again? While Star Wars dwindles in the aftermath of the prequels and animated Clone Wars, Star Trek has the opportunity to nab the Sci-Fi throne. James Cameron’s epic bleeding-edge film that we know nothing about. Even though we have seen literally (almost) nothing from the film, hopes and hype are high for this potential industry-changing film. We put our faith in James Cameron and his notion of quality of quantity film-making. Warner Brothers’ next blockbuster DC Comics film. Can it compare to this year’s The Dark Knight? Will Fox Studios’ litigation proceedings delay or harm the film? We hope that Fox stops interfering and playing this money-grabbing game. The Wolverine origins flick recently made the jump into my top three simply because of the trailer that was released two weeks ago. I’m a huge Gambit fan and seeing some amazing scenes with him made me super excited for the film. The caveat to this is that if I find out Gambit does not have his Cajun accent in the film - then this movie will no longer by featured in my list. We know very little about James Cameron’s Avatar and we’ve seen even less so it’s very difficult to gauge where it should rank but I threw it in there anyways because of the hype of the film, the crazy technology being employed to produce it, and the fact that it’s Cameron’s baby. I also threw in The Imaginarium of Doctor Parnassus for the simple fact that it is Heath Ledger’s last film ever and the casting additions that were made to complete Ledger’s role in the film were pretty astonishing. For fun, I also threw in G.I. Joe as my last pick even though we’ve not seen any real footage and there is some negative press surrounding some pre-screenings of the trailer for the film. Vic is a massive Trek fan so his number one choice is a given. His top three can easily shift around depending on what kind of marketing the three films get and it’s the top six in the list he really looks forward to – with the last four added to round off the top 10. Vic is looking forward to the fourth installment to the Terminator franchise and has confidence that McG will do a good job. He’s also hoping that Up will make up for his disappointment with Wall-E. On the other hand, Vic is also anticipating the Wolverine-centric movie but is not sure if it will be that good. Bruce’s list is quite unique with him being the only one to include 2012, Knowing and Fast & Furious. Those two choices have him on shaky ground here as a continuing writer (JUST kidding!). The following is Heath McKnight’s most anticipated films of 2009. Heath shows some favor to the two big animated films of next year and does not include Star Trek in his list. Niall has Edge of Darkness starring Mel Gibson in comeback-mode as his unique #1 choice for next year. Carl makes the unique picks of having Push and Assassination of a High School President in his Top 10. Kofi admits that Friday the 13th is his guilty pleasure. I forgive him as I put G.I. Joe as my number ten. Ross includes the unique Top 10 movie picks of The Soloist and Notorious. That’s it for our individual lists. So there you have it, sliced every which way! Special mentions also go out to The Surrogates, Harry Potter and the Half-Blood Prince, Sherlock Holmes, The Wolf Man and the Imaginarium of Doctor Parnassus for all being included in several of our individual top-10 lists. Some of those just barely missed out on being included in the finalized top-10 and we are certainly looking forward to them as well, among others. What movies are you looking forward to in 2009? Are you as excited for next year’s slate of films as I am? And here's a final question for you: Which of our writers' movie tastes best match yours?